A conference for researchers and practitioners with an interest in multidisciplinary approaches to exclusionary practices in resource extraction. This conference aims to (re)examine the types and forms of exclusion that continue to be generated as a result of resource extraction or have emerged more recently as a result of new industry practices. In addition, investigation of informal activities, which often emerge as a consequence of large-scale projects, will make visible an often-overlooked area of academic study. A focus will be placed on identifying potential pathways towards new inclusionary and collective forms of resource governance. Our objective is to explore how multidisciplinary perspectives can improve the understanding of these exclusion(s), their (re)production, and their contestation, thereby opening a conversation between academics and practitioners on new possibilities for inclusion. Who and what gets excluded from the production of knowledge and the governance of resource extraction at different stages of resource projects? How can communication across industry, civil society, government, and academia be improved? 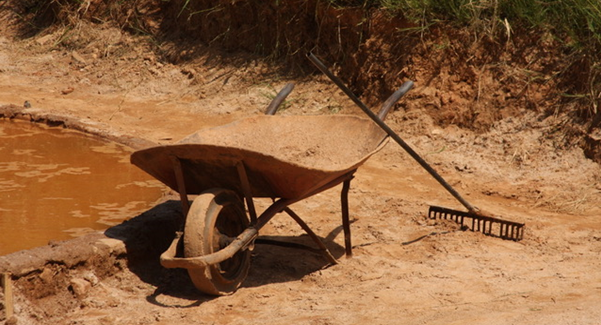 What can be learned about exclusion from the experiences in informal mining? How can we rethink and engage with inclusion in academia and beyond in order to respond to different forms of exclusion by utilizing innovative and novel research methodologies? The conference aims to bring together around 50 participants - academics at different levels of their career and practitioners (civil society representatives, journalists, government and industry representatives). Large-scale mining and energy projects have played a central role in the global neoliberal model of development, which has consolidated over the past 50 years. Around the world, exclusion of individuals and communities from access to land, decision-making, planning, and benefits accompanies every action taken by resource developers and their supporters in and out of government. Critiques of this hegemonic model have emerged from academia and beyond. They have revealed the negative economic, ecological, and societal consequences of this type of resources development and contributed to a reshaping of industry practices, marked by the uptake of novel managerial tools (e.g. Social and Environmental Impact Assessments), domestic and international regulations, international industry agreements and guidelines, and consumer pressure tactics. In addition, these critiques have opened new conceptual challenges - including the need to rethink 'development' as such. Despite these evolving business practices, the extractive industries continue to operate in ways that often (re)produce already challenged and much-critiqued exclusionary practices. Moreover, academic focus on the resource curse narrative and exclusion from a narrow definition of economic development has tended to shift attention away from other, widespread forms of exclusion, such as exclusion from knowledge production, policy-making, land use, and employment. At the same time, new challenges stemming from the on-going neoliberalisation of resource development and its local impacts, as well as novel forms of political participation and communication, influence how exclusion is produced, experienced, and contested on the ground. The recent mass protests against the Dakota Access Pipeline in the United States are just one of many examples illustrating how various forms of exclusion continue to impact and be contested by both local and international communities. This conference aims to forge a scholarly approach to exclusions that encompasses the epistemic level (who and what gets excluded from knowledge production in resource extraction projects) and the everyday experiential level (who and what gets excluded on the ground and from what), as well as considering their co-production. The focus is placed on resource extraction. While not giving priority to any particular geographical area or scale, an emphasis on exclusion invites consideration of places, localities, populations, and subjects who are epistemically, socially, politically and/or economically marginalised or underrepresented. If interested in presenting at the conference, please submit an abstract of your presentation or proposed contribution and suggest which of the sessions below (A-G) you want to take part in. The conference is open to researchers and those with an interest in exclusionary practices in resources extraction at all career levels and from all fields. Applications from Indigenous scholars or activists and residents in resources-extracting regions are especially encouraged. Please submit your abstract no later than 1 August 2017. Political ecology has, since its emergence in the 1980s1, revealed the political nature of environmental injustices related to natural resource extraction. It has, in particular, unravelled structural exclusions produced through extractive projects. Over time, the field of political ecology has, however, experienced significant transformations in terms of scope and objectives as a result of growing conversations with other bodies of literature, as well as new contemporary socio-environmental challenges2. With the post-structural turn, theoretical concerns have switched from politico-economic structures of exclusion to new definitions of the political, including a focus on environmental identities. More recently, attempts to refocus debates on materiality have also opened new research paths3. This panel will examine how new political ecologies have been used in research on natural resource extraction at the same time as it invites consideration of how it can be supplemented with insights from across development, anthropology, and geography. It also interrogates how such theoretical concerns can be communicated and translated for applications beyond academia. Feminist and postcolonial analyses of resource projects have drawn attention to the neo-colonial ethics that underlie such activities and revealed the (re)production of exclusionary practices at the intersection of gender, race, class, ethnicity, ability, and citizenship4. This section draws on recent concerns with feminism, postcoloniality, and decoloniality in the field of resource extraction to unearth subjugated and exclusionary knowledge, and use the margins as a site of epistemic privilege in order to: first, observe the exclusions produced by resource extraction activities; and second, document everyday forms of resistance by affected actors. It invites participants to observe exclusion/resistance and inclusion through a postcolonial/feminist framework attentive to questions of language and discourse, as well as lived experiences. Oil, gas, and mining projects have profound local impacts, and while international agreements, such as the Aarhus Convention5 and ILO Convention 1696, stipulate that affected communities, such as indigenous groups and other land-users, have a right to participate in decision-making procedures, actual practice on the ground often falls short of established 'best practice principles'7. This session will explore how certain forms of knowledge are produced and gain the epistemic authority to influence procedures, regulations, and decisions, question whether Social and Environmental Impact Assessments are appropriate tools to include the voices and knowledge of different stakeholders, and take a closer look at the exclusion of human and non-human actors from the decision-making process. A particular focus will be placed on exploring alternative methods of citizen science, public involvement, and activist research in the decision-making phase of hydrocarbon and mining projects. During the different stages in the life cycle of an oil, gas, or mining project, diverse interests regularly clash - often with far-reaching consequences for stakeholders and/or the overall project. Certain voices are thereby excluded from the debate either intentionally or by accident. Even when communication does take place, it is often non-effective. This session will bring together industry and state representatives, academics, and activists with the aim of facilitating a productive discussion seeking to identify barriers to meaningful communication among stakeholders, while placing a clear focus on finding solutions to recurring problems. From environmental destruction and violence in the Niger Delta, to the lasting social impacts of the Exxon Valdez tanker accident, and conflicts over oil activities on indigenous land in the Amazon, disruptions caused by the extractive industry in local communities have been documented across the globe8. At the same time, increased awareness among consumers, new corporate social responsibility (CSR) and transparency initiatives, companies' recognition of the potential benefits of having a 'social license to operate', and Impact and Benefit Agreements are purported to have the potential to counter negative impacts and create local benefits.9 However, interactions between communities and companies continue to be characterized by conflict and violence in many cases and local communities often struggle to secure positive outcomes from resource development. With the aim of exploring how effective corporate social and environmental management could be achieved in current and future projects, this session seeks to engage with new approaches to interactions between the extractive industry and local communities in particular during and after the phase of production. Although informal mining activities provide livelihoods for millions of poor people in mineral rich developing countries, they remain an under-researched area in resource management.10 Commonly associated with precariousness and illegality, the poverty reduction effects of these activities, that often emerge within and around larger extractive projects, has, however, been acknowledged.11 Ethnographic research in different settings has also focused on the lived experiences of miners and revealed the sometimes-contested nature of informal mining activities in different settings.12 This panel proposes to raise attention to these ambivalent experiences of informal mining with a focus on their simultaneously exclusionary and inclusionary nature. In particular, it questions which forms of exclusions are (re)produced through these activities as well as it interrogates how contestation(s) to the exclusions produced by larger mining projects are articulated through involvement in informal mining. Challenges posed by changes in the extractives industries as well as new directions in the conceptual study of extraction are inseparable from changes in methodologies of study.13 Increasingly, these changes demand the examination of the extractive aspects of methodology itself. Reacting to feminist and postcolonial critiques, reflexivity and activism increasingly influence study design.14 Emphasizing the materiality of resources15, to reflect a more-than-human focus, has led to new ways of collecting data and the analysis of extraction projects and their wider impact. This panel considers extractive methodologies and methods to study extraction, including but not limited to: multi-sited ethnography, mapping, digital analysis, walking, photography, film, and sketching. 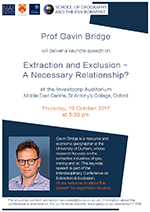 We are delighted to welcome Prof Gavin Bridge to deliver the conference keynote speech: "Extraction/Exclusion - a necessary relationship?" This speech will take place at the Investcorp Auditorium, Middle East Centre, St Antony's College, 62 Woodstock Road, OX26JF, Oxford from 17:30 to 18:45 on 19/10/2017. All are welcome to attend this speech! No registration required. Prof Gavin Bridge is a resource and economic geographer at the University of Durham, whose research focuses on the extractive industries of gas, mining and oil. His work spans questions related to political ecology of resource scarcity and security, new geographies of resource production/consumption, global production of raw materials, and geographies of energy transition and governance. Gavin is also the co-author of the recently published book Oil with Philippe Le Billon. For more information about Prof Gavin Bridge, please see his webpage at the University of Durham. Registration (free of charge) will open in late August. Limited bursaries for travel and accommodation may be available. Please contact the conference organizers. Bed and Breakfast and Self Catering Accommodation in Oxford University Colleges. Rooms are also available at the Department of Continuing Education. Numerous hotels are available via booking.com and similar search engines. The conference will take place at St Antony's College (Investcorp buildling, Middle Eastern Centre; Hilda Besse Building, and Syndicate Room). Please follow signs at the entrance and ask for directions at the Porter's Lodge if there is any issue. For further queries please contact the Conference Team - Negar Elodie Behzadi, Nina Doering and Stephanie Postar - via: extraction-exclusion@ouce.ox.ac.uk. Blaikie, P. (1985) The Political Economy of Soil Erosion in Developing Countries. London; New York: Longman. Watts, M.J. (1983a) On the poverty of theory: Natural hazards research in context. In, Hewitt, K. (ed.) Interpretations of Calamity: From the Viewpoint of Human Ecology. Boston: Allen & Unwin, pp. 231-262. Perreault, T., Bridge, G., Mc Carthy, J. (2015) The Routledge Handbook of Political Ecology, Routledge, New York. Peet, R. and Watts, M.J. (eds) (2004) Liberation Ecologies (2nd edition). Routledge. (first edition 1996). 3 Bakker, K. and Bridge, G. (2006) Material worlds? Resource geographies and the 'matter of nature'. Progress in Human Geography 30(1): 5-27. 4 Murrey, A. (2016) Slow dissent and the emotional geographies of resistance. Singapore Journal of Tropical Geography, 37(2): 224-248. 5 UNECE (25 June 1998) Convention on access to information, public participation in decision-making and access to justice in environmental matters. Accessed 13 Jan 2017. 6 ILO (5 Sep 1991) C169 - Indigenous and tribal peoples convention, 1989 (No. 169). Accessed 13 Jan 2017. Cooke, B. and Kothari, U. (eds.) (2001) Participation: The new tyranny? London and New York: Zed Books. O'Faircheallaigh, C. and Corbett, T. (2005) Indigenous participation in environmental management of mining projects: The role of negotiated agreements. Environmental Politics, 14(5): 629-647. O'Faircheallaigh, C. (2007) Environmental agreements, EIA follow-up and aboriginal participation in environmental management: The Canadian experience. Environmental Impact Assessment Review, 27(4): 319-342. Nuttall, M. (2012) The Isukasia iron ore mine controversy: Extractive industries and public consultation in Greenland. Nordia Geographical Publications, 41(5): 23-34. Orta-Mart�nez, M. and Finer, M. (2010) Oil frontiers and indigenous resistance in the Peruvian Amazon. Ecological Economics, 70(2): 207-218. O'Rourke, D. and Connolly, S. (2003) Just oil? The distribution of environmental and social impacts of oil production and consumption. Annual Review of Environment and Resources, 28: 587-617. Ritchie, L. (2012) Individual Stress, collective trauma, and social capital in the wake of the Exxon Valdez oil spill. Sociological Inquiry, 82(2): 187-211. Watts, M. (2001) Petro-violence: Community, extraction, and political ecology of a mythic commodity. In, Peluso, N. and Watts, M. (eds.) Violent Environments. Ithaka, London: Cornell University Press, pp 189-212. O'Faircheallaigh, C. (2013) Community development agreements in the mining industry: an emerging global phenomenon. Community Development, 44(2): 222-238. Owen, J. and Kemp, D. (2013) Social licence and mining: A critical perspective. Resources Policy, 38(1): 29-35. Watts, M. (2005) Righteous oil? Human rights, the oil complex, and corporate social responsibility. Annual Review of Environment and Resources, 30: 373-407. 10 Lahiri-Dutt, K. (2004) Informality in mineral resource management in Asia: Raising questions relating to community economies and sustainable development. Natural Resources Forum, 28(2): 123-132. Bryceson, D.F. et al. (2014) Mining and Social Transformation in Africa: mineralizing and democratizing trends in artisanal production. New York: Routledge. Fisher, E. (2007) Occupying the margins: Labour integration and social exclusion in artisanal mining in Tanzania. Development and Change, 38(4): 735-760. Hilson, G. (2010) "Once a miner, always a miner": Poverty and livelihood diversification in Akwatia, Ghana. Journal of Rural Studies, 26(3): 296-307. Lahiri-Dutt, K. (2012) Digging women: towards a new agenda for feminist critiques of mining. Gender, Place & Culture, 19(2): 193-212. 13 Jenkins, J., Boone, K., Bosworth, K., Lehman, J. and Loder, T. (2015) Boom and Bust Methodology: Opportunities and challenges with conducting research at sites of resource extraction. Extractive Industries and Society, 2(4): 680-682. 14 Sawyer, S. (2004) Crude Chronicles: Indigenous politics, multinational oil, and neoliberalism in Ecuador. Durham, London: Duke University Press. 15 Richardson, T. and Weszkalnys, G. (2014) Resource materialities. Anthropological Quarterly, 87(1): 5-30.